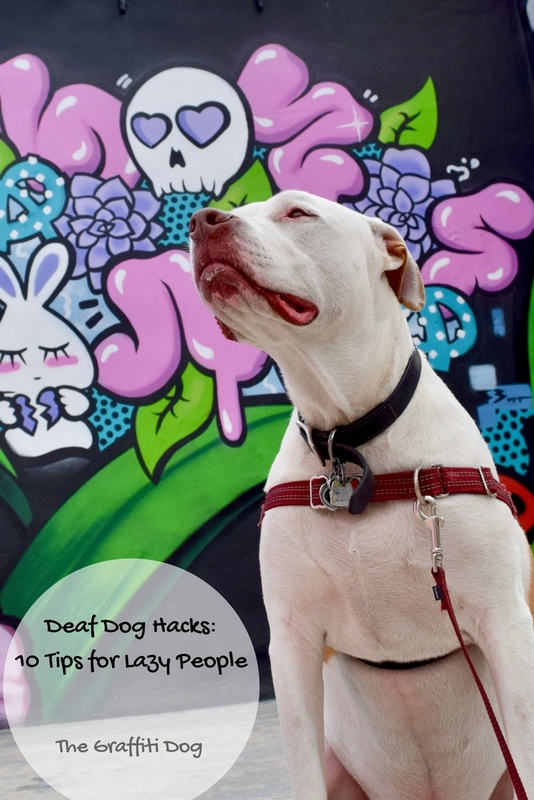 I love deaf dog hacks, those simple tricks and tips that make training and day-to-day life with a deaf dog easier. Today, I’m sharing 10 of my favorite deaf dog training and life hacks, some of which are common sense while others are those “Ah, ha!” moments I’ve had along the way- things I figured out quite by accident while raising, training and living with two deaf dogs for the last five years. MY NAME IS BERNARD AND I’M LAZY. Not when it comes to work, I mean, or other critical things. But when it comes to household chores or running errands or other basic life tasks, it’s hard to get me off the couch. Or into pants. Because I’m lazy, I’m always looking for the easiest way to accomplish something with as little effort as possible. My search for shortcuts and productivity tips often leads me to those lists of life hacks that clutter the internet. I can (and do) spend hours searching for hacks to keep my house clean and tidy. Now, if I spent that time actually cleaning my house, I wouldn’t have a sink full of dirty dishes, but hey, my husband and I have decided to find me charming. I find deaf dog hacks irresistible because, well, the path of least resistance is my mantra. I like short cuts that get me to my goal faster with less effort on my part- things like keyboard shortcuts that do the heavy lifting when I’m writing or taking side streets that will shave 5 minutes off my trip so I can get back home, out of my pants and back on the couch. Lazy- that’s me, and I’m pretty okay with it. 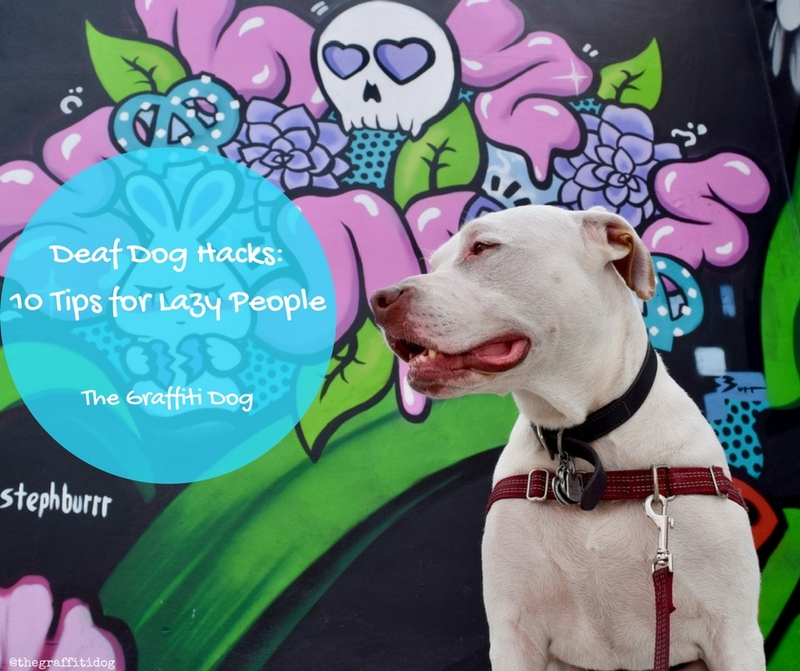 One night recently, while sitting on the front porch thinking deep thoughts and wondering when the Kitchen Fairy was going to show up to wash the dishes, I realized I could share some of my own personal deaf dog hacks without a lot of effort. It was bullet points, for God’s sake, how much work could that be? Educational and easy- two birds, one stone. Things didn’t go quite as planned. 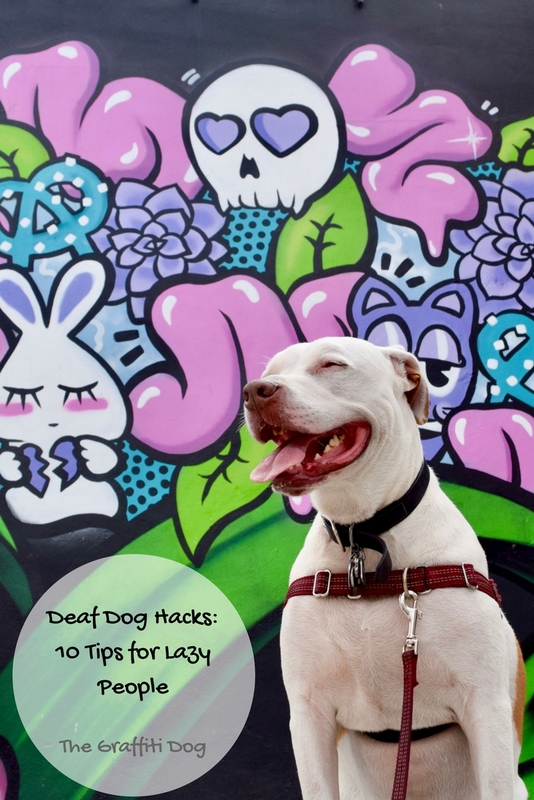 The road getting here was a little bumpier than anticipated but here we are: 10 deaf dog hacks that will make your life easier. You can flick a light on and off to get your dog’s attention. This is particularly useful if your dog is outside after dark (in a securely fenced in area, of course) and you’re too lazy to walk outside then over to him to get his attention- remember, if he can’t see you, he can’t hear you. Once you flicker the lights and he looks at you, give the sign for “come”. He’ll come running back inside and you can lock the door and get back to bingeing “Golden Girls” on Hulu. In time, your deaf dog will begin to associate flickering lights with “come” and you won’t even need to give him that sign! If you’re like me and have three or more dogs, you’ve probably noticed a pack structure and mentality form. If so, this hack is for you! Assuming you have both deaf and hearing dogs, call your hearing dogs back inside. So long as your deaf dogs can see your hearing dogs running to you, they will follow the pack and will come back inside too. Back to the couch…zero energy exerted! I actually wrote an entire post about why you should talk to your deaf dog, but in short, when we speak, our facial expressions and body language change. When that happens, we convey a whole lot more information to them. By using my whole body to communicate, he understands me better. Throughout your deaf dog’s life, you should constantly practice and reinforce the basic commands he knows. Using positive reinforcement, make sure to reward him when he responds correctly to any hand sign. As you teach him more signs, you’ll need to reinforce these too. Unless it’s a sign for a behavior that requires you to be physically engaged, you can reinforce these signs while sitting on the couch. However, if you’re reinforcing a sign that requires your active physical involvement, such as “let’s run” or “let’s dance like this is a mosh pit”, I’m sorry but you’re gonna have to either get off your duff or get your husband to do it. This is probably my favorite deaf dog training hack! You can easily teach a bunch of signs with zero effort by using passive training techniques. You’ll be amazed at how quickly your dog’s vocabulary increases! Each time you engage in a specific activity, give your deaf dog the corresponding sign. For example, everytime you feed him, give him the sign for ”food” or “eat”. Everytime you fill up his water bowl, give him the sign for ”water”. The same goes for walk, run, play, car ride or any other activity you want to teach a sign. Edison knows when we’re headed to take photos because I gave him the sign for “camera” every time we got ready to leave for our photoshoot. He now excitedly but patiently waits at the front door if I give him the sign for “camera”. Teaching hand signs to dogs who can hear you may seem like extra, unnecessary work but I promise you that this is a hack that will make your life easier NOW as well as in the future! Since I live with 2 deaf dogs and 2 hearing dogs, I have to talk with my hands and with my voice so each of them understands what I’m saying. I have enough trouble remembering their names let alone how i need to communicate with them! By teaching my hearing dogs hand signs, I can communicate with all 4 dogs with just my hands- and I can go entire days without speaking. Chances are your veterinarian won’t let you assist during medical procedures, such as blood collection, vaccinations or other medical procedures your dog will find uncomfortable. This is for your safety as well as your dog’s and clinic staff. Animal handling and safe and proper restraint are skills your veterinary technician and veterinarian are taught in school. To make your dog’s visit to the veterinarian less stressful for your dog, your vet, your veterinary technician and other clinic staff, teach the staff some very basic hand signs. You can write down the signs (perhaps with diagrams, if you’re feeling ambitious!) for them to refer to when your dog visits for his annual exam, vaccinations or other medical treatments. Basic signs you should consider teaching are sit, stay, come, down and good boy/ good girl. Though all of my dogs wear collars with name and other tags, I always walk them using a harness. A properly-fitting harness is much more secure than a collar (they are nearly impossible to pull out of) and also because they shift pressure from your dog’s trachea to his body. This reduces the risk of him pulling on the leash and damaging his trachea. I prefer a front-loading harness where the leash clips onto the harness on my dog’s chest. In addition to being more secure and preventing damage to the trachea, this type of harness can also help prevent pulling on the leash if that’s something your dog does. Many congenitally deaf dogs have pink or white unpigmented skin. Unpigmented skin is more likely to be sensitive and react to chemicals or other irritants. If your deaf dog has sensitive skin, try using a gentle herbal and/or oatmeal shampoo. We like Dr. Harveys Herbal Protection Dog Shampoo. This is an organic shampoo with real herbal extracts such as Organic Coconut Oil, Organic Olive Oil, Organic Jojoba Oil, Organic Aloe Vera, Organic Rosemary Extract and Organic Sage Extract among others. This shampoo is detergent, paraben and phosphate-free with no perfumes, synthetic detergents, fragrance or animal by-products. Photosensitivity In addition to having sensitive skin, many deaf dogs with pink or white unpigmented skin are photosensitive, meaning bright sunlight bothers their eyes. If you notice your deaf dog avoiding or squinting when in direct sunlight, the best first step is to have him examined by a veterinarian or veterinary ophthalmologist to make sure nothing more serious is going on. 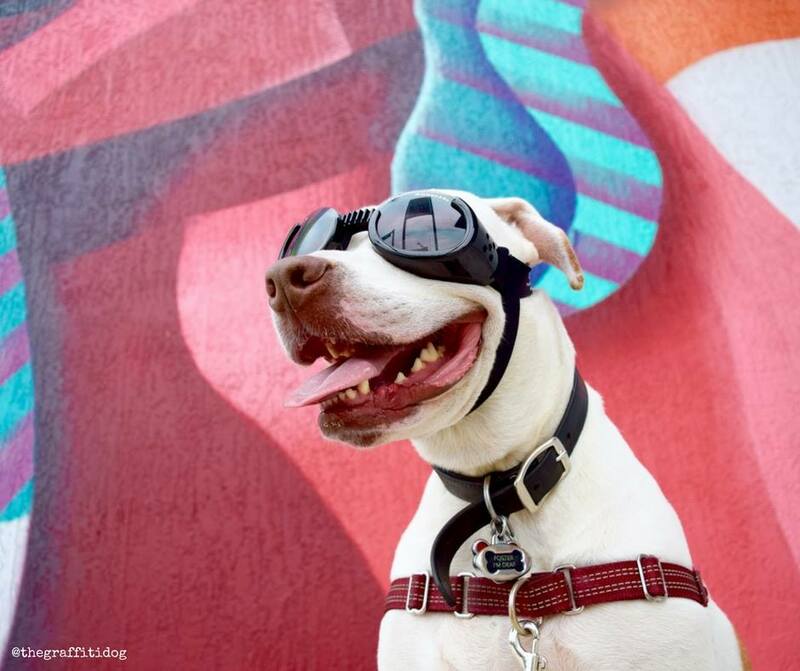 If your vet determines that your dog is photosensitive due to his lack of pigmentation, you should look into dog sunglasses with UVA/UVB protection. We like Doggles and have several pair for Edison. In addition to protecting his eyes, they make him look like the rock star he is. No, it’s not harder, it’s just different. Which of these hacks is your favorite? What hacks would you add to this list? Hearing is not just about UNDERSTANDING words is i? Hearing is also about vibration, and seeing emotion. Feelings are harder to quantify but they are another dimension of expression beyond the aural aren’t they? We need to use them all. I love the talk to your deaf dog! I owned an old cocker spaniel who was deaf. It really was hard to tell. He just followed my other dog around, and me of course. Deaf dogs do rock! I also liked the hand signals. I used thos a lot with Buddy. Great post.